Premenstrual syndrome (PMS) is a group of symptoms that start one to two weeks before a menstrual period. Aproximately three out of four women experience some PMS symptoms, and they tend to peak during late 20s and early 30s. PMS symptoms typically occur in a predictable pattern and are triggered by hormone fluctuations. One of the most common symptoms of premenstrual syndrome is fatigue. Fatigue is defined by the overall feeling of weakness, exhaustion, and decreased energy levels. Keep reading to learn more about fatigue and premenstrual syndrome. Fatigue can be caused by lifestyle factors like high stress, poor diet, or insufficient exercise. It occurs when the body has to work harder than usual to carry out everyday activities. Fatigue can also cause symptoms like difficulty concentrating, irritability, and headaches. Several ways to ease fatigue symptoms are to take a walk, eat healthy snacks every few hours, and get sufficient sleep each night. PMS is primarily caused by hormone fluctuations during the weeks before a woman gets her menstrual period. PMS can also be triggered by stress, poor diet, and chemical changes in the brain, specifically fluctuations of serotonin. Insufficient amounts of serotonin can cause depression, fatigue, and foods cravings. PMS symptoms can range from mild to severe. Severe PMS is also called premenstrual dysphoric disorder, or PMDD. PMS symptoms can be physical or emotional. Physical symptoms include fatigue, headache, bloating, cramping, acne breakouts, and tender breasts. Emotional symptoms of PMS can include irritability, mood swings, and depression. Symptoms typically subside once the menstrual period starts. 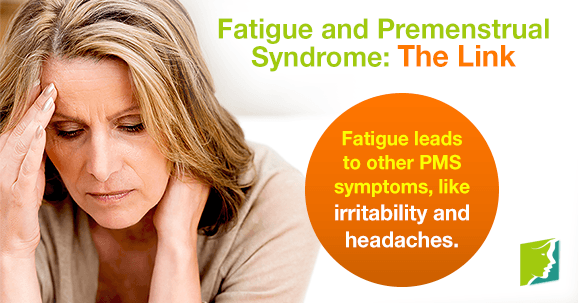 Fatigue and premenstrual syndrome are directly linked because fatigue is typically caused by PMS. Fatigue then leads to and amplifies other PMS symptoms, like irritability and headaches. For many women, this is a monthly occurrence. Fatigue results from changes in levels of certain hormones (estrogen, progesterone) and neurotransmitters (serotonin) during the last phase of the menstrual cycle. Not all women will be affected by fatigue, but for those who are, hormonal changes during PMS can result in physical fatigue. The good news is that the best way to deal is to listen to your body and rest. Fatigue is just part of the body's normal response to the changes that occur during menstrual cycle. There are several things to do in order to manage PMS symptoms. To prevent symptoms, simple lifestyle changes can be made, such as exercising regularly (at least 30 minutes of aerobic activity daily) and eating healthy - plenty of fruits, vegetables, and calcium. Salty foods, caffeine, and alcohol have been known to worsen PMS symptoms, so it is wise to avoid those things during menstruation. Additionally, certain medications can help alleviate PMS symptoms. Oral contraceptives can be helpful because they regulate menstrual periods and stabilize hormonal swings. Antidepressants, like selective serotonin reuptake inhibitors, have been known to help relieve PMS symptoms like fatigue and mood swings. Taking Selective serotonin reuptake inhibitors (SSRIS) should be limited to the two weeks before menstruation begins. Anti-inflammatory drugs, like ibuprofen and naproxen, can also be beneficial for PMS symptoms like bloating and cramping. Fatigue and premenstrual syndrome are linked due to the fact that PMS causes fatigue, which leads to and amplifies other PMS symptoms. It is important to live a healthy lifestyle and reduce stress as much as possible in order to prevent these symptoms. Taking anti-inflammatory drugs and antidepressants can also help alleviate symptoms. If none of the suggested treatment options offer you any relief, it may be time to see a doctor. Writing down your symptoms and how long they last can be useful for the doctor to determine appropriate treatments for your situation. This article discusses why thyroid problems can cause fatigue.